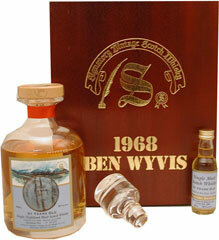 Ben Wyvis was demolished in 1977, and only a handful of bottlings have ever been released as a result. Guess what, Ben Wyvis Single Malt Scotch Whisky is up there with some of the rarest in the world. If you own a bottle then you are very lucky indeed, as collecters often travel the world to add a bottle to their collection.